CLEVELAND, Nov. 14, 2013 /PRNewswire/ — The Content Marketing Institute (CMI) and Blackbaud have released the findings from a first-time study that shows how nonprofit professionals in North America approach content marketing. The study shows that 92 percent of nonprofit professionals use content marketing. Ninety-one percent use Facebook to distribute content, and 65 percent are producing more content than they were one year ago. In addition, 69 percent of nonprofit organizations have someone in place who oversees content marketing, but only 25 percent have a documented content strategy. Overall, just 26 percent say they are effective at content marketing, the creation and distribution of educational and/or compelling content in multiple media formats to attract and/or retain clients/constituents. 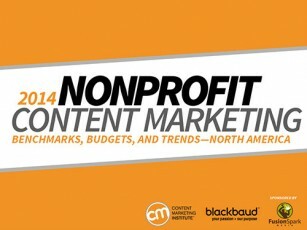 2014 Nonprofit Content Marketing: Benchmarks, Budgets and Trends—North America was produced by Content Marketing Institute and Blackbaud and sponsored by FusionSpark Media, Inc. The survey was mailed electronically to a sample of nonprofit marketers from lists provided by Content Marketing Institute, Blackbaud, MarketingProfs, and Brightcove. A total of 1,714 nonprofit professionals from North American organizations responded in July and August 2013, representing a full range of industries, functional areas, and organization sizes. The full report can be downloaded here. Content Marketing Institute is the leading global content marketing education and training organization. CMI teaches enterprise brands how to attract and retain customers through compelling, multi-channel storytelling. CMI’s Content Marketing Worldevent, the largest content marketing-focused event, is held every September, and Content Marketing World Sydney, every March. CMI also produces the quarterly magazine Chief Content Officer, and provides strategic consulting and content marketing research for some of the best-known brands in the world. CMI is a 2012 and 2013 Inc. 500 company. Serving the nonprofit and education sectors for 30 years, Blackbaud (NASDAQ: BLKB) combines technology and expertise to help organizations achieve their missions. Blackbaud works with more than 29,000 nonprofit customers in more than 60 countries that support higher education, healthcare, human services, arts and culture, faith, the environment, independent K-12 education, animal welfare and other charitable causes. The company offers a full spectrum of cloud-based and on-premise software solutions and related services for organizations of all sizes including: fundraising software, online fundraising software, event fundraising software, advocacy, constituent relationship management (CRM), analytics, financial management and vertical-specific solutions for ticketing, school management, and more. For more information, visit www.blackbaud.com. Except for historical information, all of the statements, expectations, and assumptions contained in this news release are forward-looking statements that involve a number of risks and uncertainties. Although Blackbaud attempts to be accurate in making these forward-looking statements, it is possible that future circumstances might differ from the assumptions on which such statements are based. In addition, other important factors that could cause results to differ materially include the following: general economic risks; uncertainty regarding increased business and renewals from existing customers; continued success in sales growth; management of integration of acquired companies and other risks associated with acquisitions; risks associated with successful implementation of multiple integrated software products; the ability to attract and retain key personnel; risks related to our dividend policy and share repurchase program, including potential limitations on our ability to grow and the possibility that we might discontinue payment of dividends; risks relating to restrictions imposed by the credit facility; risks associated with management of growth; lengthy sales and implementation cycles, particularly in larger organization; technological changes that make our products and services less competitive; and the other risk factors set forth from time to time in the SEC filings for Blackbaud, copies of which are available free of charge at the SEC’s website atwww.sec.gov or upon request from Blackbaud’s investor relations department. All Blackbaud product names appearing herein are trademarks or registered trademarks of Blackbaud, Inc.